h-x-app is a proposed microformats vocabulary for marking up data about software applications. There's a bunch of research into existing formats and potential properties over on store. See below for current, experimental usage. Barnaby publishes h-x-app markup with name, logo/photo and url properties on waterpigs.co.uk via Taproot, also marked up as h-product, to provide basic information about the Note Posting UI to authorization UIs. Aaron Parecki publishes h-x-app markup with name, logo and url properties on http://quill.p3k.io and other p3k applications to provide basic information about the application to authorization UIs. Aaron also added h-x-app markup to the IndieWebCamp wiki with name, logo/photo and url properties. Pelle Wessman publishes h-x-app markup with name, url and responses properties on webmention.herokuapp.com since 2015-08-24. Barry Frost publishes h-x-app markup on his Micropublish client with name and url properties. 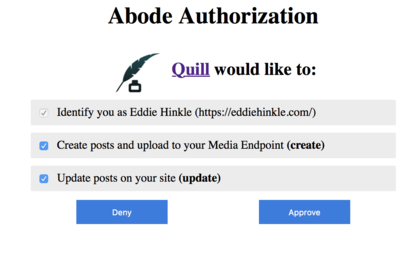 Eddie Hinkle publishes h-x-app markup with name, and logo properties on http://indigenous.abode.pub to provide basic information about the native iOS app application to authorization UIs. gRegor Morrill publishes h-app and h-x-app on indiebookclub. Fortress exposes h-x-app with name at fortress.black.af. 00dani parses h-x-app markup in her authorization endpoint and uses the data to better present where she is logging in to. See her post about it, with screenshots of her UI. Aaron Parecki parses h-x-app (and h-app) markup in the p3k authorization endpoint to present a nicer prompt when logging in to applications. Eddie Hinkle parses both h-x-app and h-app markup in the abode authorization endpoint to present a nicer prompt when logging in and authenticating applications. IndieAuth.com consumes h-x-app when displaying the authentication/authorization prompt in order to show the application's name and icon if available. If no markup is available, then only the client_id is displayed. This page was last edited on 10 February 2019, at 16:26.